Rewired State is a website showing proposals for digital enhancements of democracy, many based on visualizing data otherwise locked away in government departments. 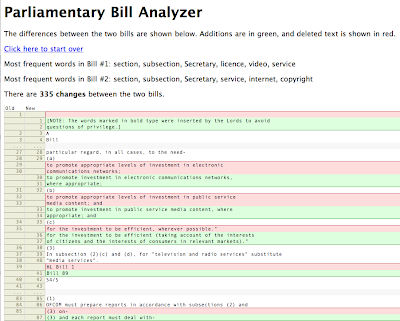 The one shown above is essentially a document comparison site that highlights what has been amended in the passage of a bill. This one shows interlinking directorships in public companies (the more boards they sit on, the fatter the cats get). There are videos of the presentations here.